ACFM Extractive Fuel Pipe Testing Alpha Industries Ltd.Alpha Industries Ltd. The Advanced coal flow measurement system (AFCM) was designed and developed strictly to measure air and fuel flows through coal pipes. 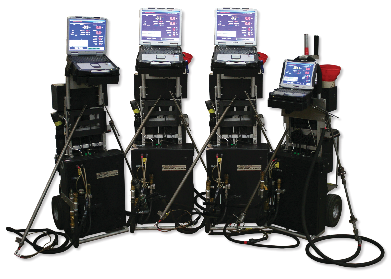 It is a computer controlled PC-based isokinetic extraction type testing system. It utilizes a dirty air probe for air flow measurement, and 3 types of advanced coal sampling probes. The computer controlled isokinetic extraction rate is adjusted point by point to maintain 100% isokinetic coal extraction across the pipe velocity profile. Each pipe is carefully tested to assure accuracy within 3% for air and 6% for coal. Any deviation out of this tolerance will nullify that particular test and restart another.